The Therapeutic Goods Administration (TGA) is responsible for regulating medical devices in Australia, including monitoring the ongoing safety, performance and quality of devices once they have been included on the Australian Register of Therapeutic Goods (ARTG). The TGA's Incident Report and Investigation Scheme (IRIS) commenced in 1986. Since its inception, the TGA has received more than 45,781 adverse event reports involving medical devices. In 2017, the TGA received 5,370 adverse event reports relating to medical devices, compared with 3,838 in 2016. 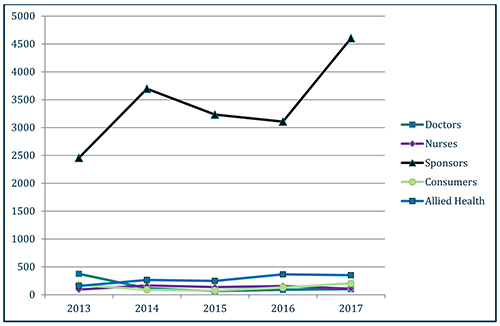 As shown in Figure 1, the vast majority of reports made in 2017 were by sponsors of medical devices. The number of reports made by sponsors was 4,604 (84.9% of all reports), compared with 3,107 reports in 2016. The number of reports made by doctors increased from 90 in 2016 to 101 in 2017 (2% of all reports). The number of reports from nurses decreased in 2017. Nurses provided 109 reports (2.1%) in 2017, down from 156 the previous year. Allied health professionals provided 351 reports (6.5% of all reports). The number of reports from consumers increased substantially from 129 reports in 2016 to 205 (3.8% of all reports) in 2017. The rise in consumer reports is due to the increased reporting by women who have suffered complications with urogynaecological mesh medical devices. It is important to note that it is mandatory under the Therapeutic Goods Act 1989 for sponsors and manufacturers to report adverse events that have led to or could have led to a death, serious illness or injury to a patient, person using the device or others. There are some exemptions under the Australian Regulatory Guidelines for Medical Devices (ARGMD). All other adverse event reports are submitted on a voluntary basis. The majority of reports submitted from allied health professionals are from hospital supply and administration areas. The remainder of the reports are submitted by a range of allied health professionals, including clinical technicians, pharmacists, biomedical engineers, ambulance officers, laboratory technicians and dentists. The TGA encourages both users and health professionals to report any adverse event they encounter involving a medical device. The IRIS inSite program works closely with health facilities to improve awareness among health professionals about medical device adverse event reporting. Health professionals play an important role in reporting problems that have caused, or could cause, harm through quality issues, difficulty of use or malfunction. The IRIS inSite project was introduced to hospitals in the northern suburbs of Sydney in 2015, following a successful pilot project trial in hospitals located in the ACT. The TGA provided education and training to several hospitals in northern Sydney; and a corresponding increase in the number of adverse event reports submitted by hospitals in this region was noted. The project has since expanded across Sydney and regional NSW health networks. The feedback from professionals has been very encouraging with a noticeable increase in reports submitted. The project officer has become a valuable partner to several core health professional and allied health groups, regularly attending and presenting at monthly meetings. The TGA encourages consumers and health professionals to report any adverse events associated with the use of a medical device. Information in the publicly searchable Database of Adverse Event Notifications (DAEN) comes from reports made to the TGA by a wide range of sources, including device sponsors, doctors, nurses, allied health professionals and members of the public. Reports in this database start from July 2012 up to three months prior to the date of access. The TGA uses this three-month period to investigate each adverse event report. The DAEN, which was launched in 2012, was created to support better health outcomes by providing access to the information that the TGA gathers while monitoring medical devices safety in Australia. The TGA undertakes proactive post-market reviews on issues noted with medical devices included on the ARTG. findings of TGA laboratory testing (routine or as part of an investigation of an adverse event report). Post-market reviews primarily focus on issues affecting a type of device, therefore all similar devices will be reviewed. Other types of reviews may focus on a material or manufacturing process, or a manufacturer who supplies several sponsors with devices. These reviews are conducted to determine if the devices continue to meet appropriate levels of safety and performance, and that the sponsor is complying with the conditions of inclusion on the ARTG following their supply in the Australian market. This type of review can have several outcomes, such as requiring improvements in design, changes to the Instructions for Use, or suspension/removal of the device from the ARTG. More information regarding actions the TGA can take when post-market reviews identify safety concerns is contained within the 'Product vigilance' section later in this report. The Advisory Committee on Medical Devices (ACMD) incorporated the functions of the Advisory Committee on the Safety of Medical Devices and the Orthopaedic Subcommittee on 1 January 2017. The Advisory Committee on Medical Devices (ACMD) provides independent medical and scientific advice to the Minister for Health and the Therapeutic Goods Administration (TGA) on the safety, performance and manufacturing of medical devices supplied in Australia including issues relating to pre-market conformity assessment and post-market monitoring. The ACMD met eight times in 2017. ACMD meeting statements are published on the TGA website. Medical Devices Safety Update provides health professionals with practical information and advice on medical device safety. The TGA applies a risk management approach to ensure therapeutic goods supplied in Australia meet acceptable standards of quality, safety and efficacy (performance). Once a therapeutic product is approved, the TGA continues to monitor the product in the market through therapeutic product vigilance activities. The aim of therapeutic product vigilance is to continually monitor and evaluate the safety and performance profile of therapeutic goods and to manage any risks associated with individual products over their life cycle. The TGA's therapeutic product vigilance framework is available on the TGA website at Therapeutic product vigilance. The maintenance and improvement of health and safety is a shared responsibility. In addition to government and regulated industry, health professionals, consumers and their respective associations play an important role in reporting therapeutic product safety related issues. The TGA defines therapeutic product vigilance tools as tools designed to facilitate the collection and evaluation of information pertaining to the benefits and risks associated with the use of therapeutic products. The main product vigilance tools used by the Medical Devices Branch in relation to medical devices are analysis of adverse event reports, annual reports for high-risk devices, and 'environmental scanning' of scientific and medical literature, media and other sources. When a medical device is cancelled or suspended from the ARTG, details are published on the TGA website. The TGA may also exchange information relating to significant safety issues with other regulatory agencies. This is often done via the National Competent Authority Reporting program. Information is exchanged on adverse events where corrective action, including recalls, is to be taken and there is a serious risk to the safety of patients and other users.